Sirens are similar to Mermaids in form with a fish like tail and Nautican like upper body largely covered with scales and small fins that allows them to glide gracefully through the seas. Sirens scour the seas looking for contact with surface dwellers to sate their curiosity about the air breathers. These magic users sing medolic enchantments that bewilder and confuse those that do not understand the bewildering nature of the seas. 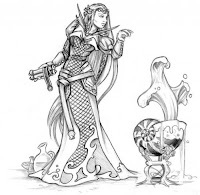 Magic: Level 1 spellcaster, can be upgraded to Level 2 for +35 pts. The Siren's songs of sorrow, joy, fear, heroism, virtue, patience, recklessness and wrath confuse and bewilder enemies within ear shot. Conversely, the same songs fill Nauticans with pride and spur them on to greater deads of valour. The siren adds +1 to the combat resolution of a Nautican unit if she is positioned in the front rank. 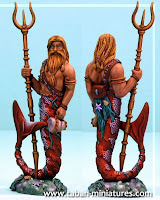 * spellcasters (ie models allowed to take arcane items) and units immune to psychology can see through the mystical presence of the mermaid to the threat that lies beneath and do not need to take a leadership test.